Some final thoughts on the closing of the Urban Grocery at the Downtown Phoenix Public Market. I’m learning more and more about the circumstances surrounding the closing of the indoor Urban Grocery at the Downtown Phoenix Public Market. While we could debate ad nauseum about the factors that led to the closing of the indoor market or point fingers at various individuals and groups, the reality is that the indoor Urban Grocery is closing at the end of business on Saturday 12 May. In summary, passion and volunteerism alone do not make a sustainable business model; one has to pay the bills. While I’m not at liberty to say the extent of what I know and name my sources, the financial situation of the indoor Urban Grocery made it inevitable that it was going to close. Unfortunately, no amount of community donations could have possibly sustained the indoor market with how it was operated. What we in the downtown Phoenix community need to do is work with organizations like Local First Arizona and others to find a local business partner to operate a downtown Phoenix grocery store. With the absence of the indoor Urban Grocery, downtown Phoenix has become a food desert, something that is fundamentally incompatible with an urban environment. I’m dreaming here, obviously, but this would be a tremendous opportunity for a group like Bashas’/AJ’s or La Grande Orange to step in. For either group, this would be a perfect entrée to downtown Phoenix. We have established that the indoor Urban Grocery is a tremendous resource for the downtown Phoenix community. Although this isn’t a perfect metric, at the time of this writing, the “Save Downtown Phoenix Public Market” Facebook page has 566 likes. There have been polls and surveys done about the Urban Grocery. But again, a place needs to be operated effectively and have sound financial footing to run. While this might sound a bit harsh, I believe that we need to move on from lamenting that the indoor Urban Grocery is closing to finding ways to write the next chapter in the life of the Downtown Phoenix Public Market. If there’s one thing that we in downtown Phoenix are good at, it’s rallying around a common cause. Let’s do that again and show our community our determination and our resolve. I’m willing to help advance this conversation as best as I can. 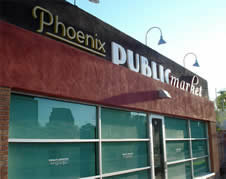 The Downtown Phoenix Public Market’s indoor Urban Grocery is closing in a week. That we know. We also know that the outdoor Wednesday evening and Saturday morning markets are staying open, Food Truck Fridays will go on, and Royal Coffee at the Market will remain open. The only thing that’s closing is the indoor component of the market. Both Royal Coffee and the outdoor components (Wednesday and Saturday open-air markets and Food Truck Friday) are staying. Some of the recent First Street/Pierce Street streetscape improvements and pedestrian enhancements really tied into the Public Market area. The City of Phoenix spent a lot of money on these projects and there is a public art component that’s yet to be completed. While those might be for the outdoor components of the market, it’s still worth noting. If memory serves, the group that owns/operates the DPPM is a public-private partnership. It’s not an indictment of anything but it’s something to keep in the back of one’s mind when evaluating this situation. I wonder if the Urban Grocery is just going to be rebranded and relaunched as something else, perhaps as an actual urban grocery store. I have no firm information to corroborate my hypothesis. It’s just a gut feeling, actually. Don’t go quoting me on this! But given the factors above, it might just be something to chew around. Don’t get me wrong: I’m sad that the Urban Grocery’s going away. It’s been a wonderful “third place” for downtown Phoenix and I’ve had many wonderful meetings and conversations there over the two-and-a-half years it’s been opened. If it goes away completely, then the loss that it has on the downtown Phoenix community is immeasurable. But if something else comes to the space, then perhaps this might have been for the better. Time will tell. I’m sure that we’ll learn more in the days and weeks to come. The Urban Grocery at the Downtown Phoenix Public Market is closing next weekend. For now, that’s all we know. The Urban Grocery at the Downtown Phoenix Public Market is closing next weekend. For now, that’s all we know. The indoor grocery store, opened a couple years ago, is closing next Saturday 12 May. What is known is that the outdoor open-air markets will continue as well as Food Truck Friday. Whatever the situation, this is sad news for downtown Phoenix. It’s hard to say why this is happening but I think part of it is a lack of density around the place and in downtown Phoenix. That an independent grocery store and hyperlocal market couldn’t survive is definitely troubling for downtown Phoenix’s renaissance. It also confuses the downtown Phoenix conversation significantly. Time will tell before we find out what’s happened. But we who fight the fight for downtown Phoenix just have been handed one of our most significant blows to date.